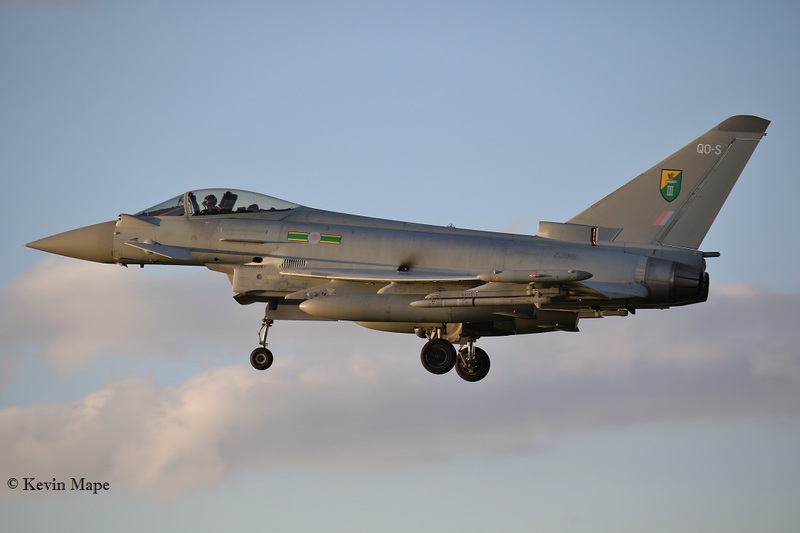 With the Typhoon FGR4 deployed to Akrotiri in Cyprus on Operation “Shader” some of the Coningsby fleet have been loosing the unit marks, Towards the end of last month the marking of 11(F)Sqn Typhoon ZK354 DG had been added and the 100 year special ZJ925 DXI had returned to standard marks. 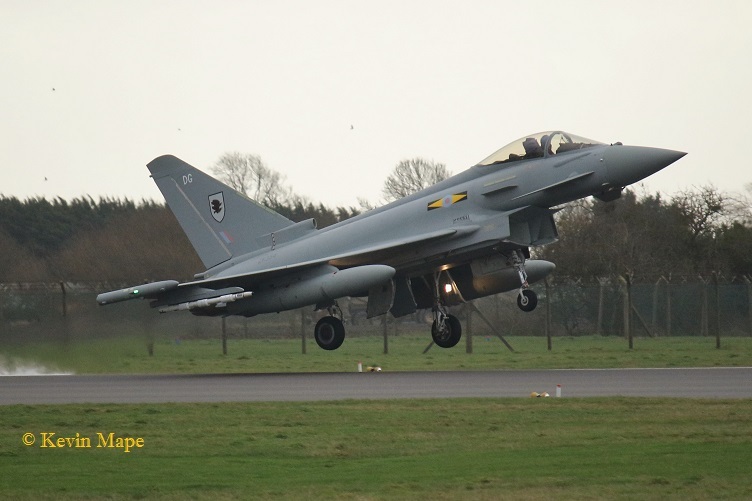 The 3(F)Sqn Typhoons that had returned to Lossiemouth in December from Oman have started to return with ZJ936 / QO-C arriving back on the 28th January, This being the first 3(F)Sqn marked Typhoon noted at Coningsby this year. 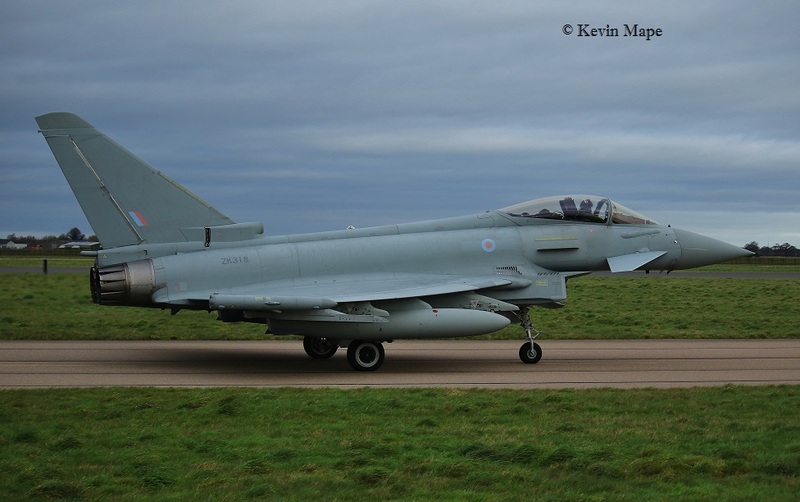 ZJ932/DB/11(F)Sqn/Typhoon FGR4 – Noted in Echo. 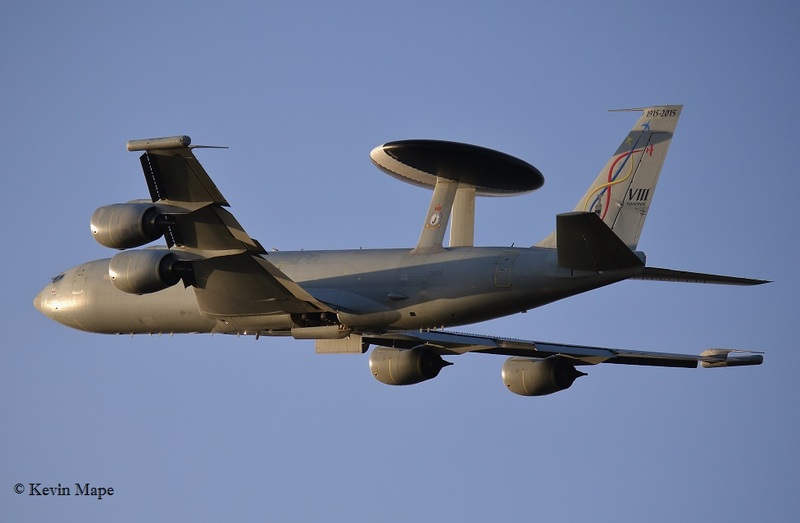 ZH106/06/8Sqn special/Sentry AEW1 c/s “NATO 30” – Departed. ZJ957/33Sqn/Puma HC2 c/s “Rider 1” – Parked in Foxtrot. 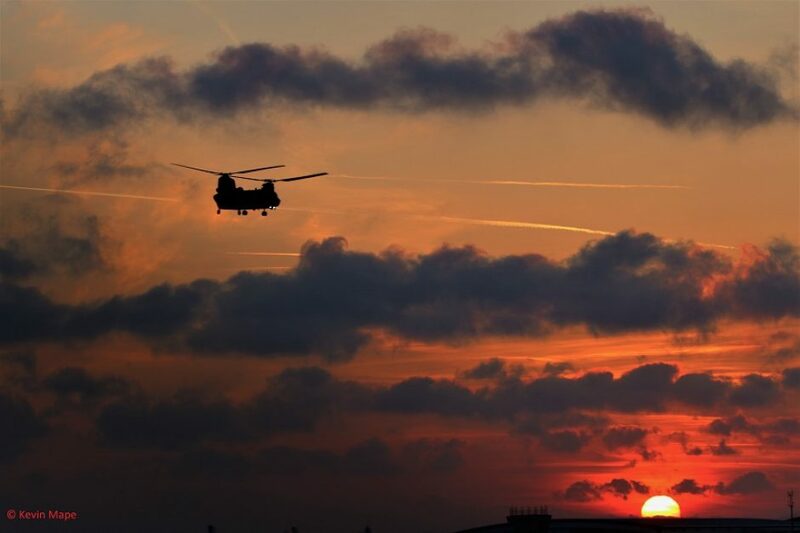 ZA705/AN/18Sqn/Chinook HC4 c/s “Pegasus 2” – Overfly to Donna Nook. 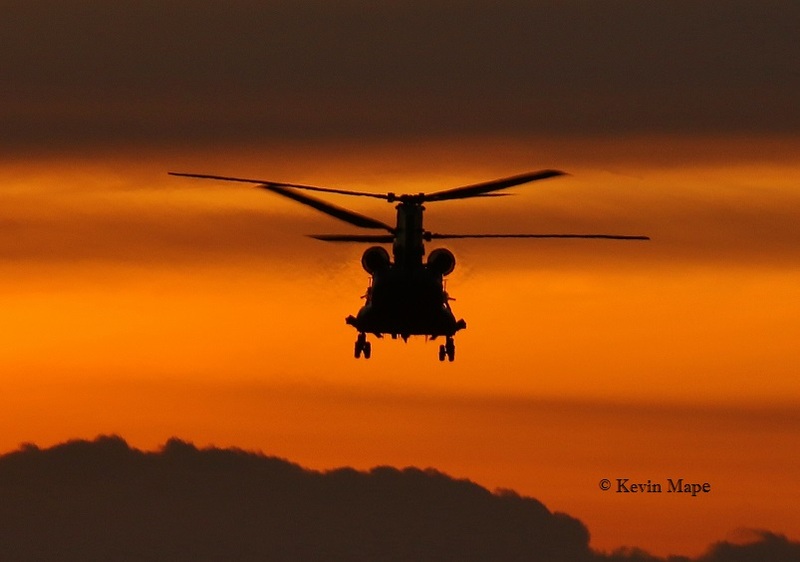 XW204/33Sqn/Puma HC2 c/s “Vortex 049” – Departed to range & returned. ZD981/18Sqn/Chinook HC4 c/s “Pegasus 1” – Parked on Sierra. 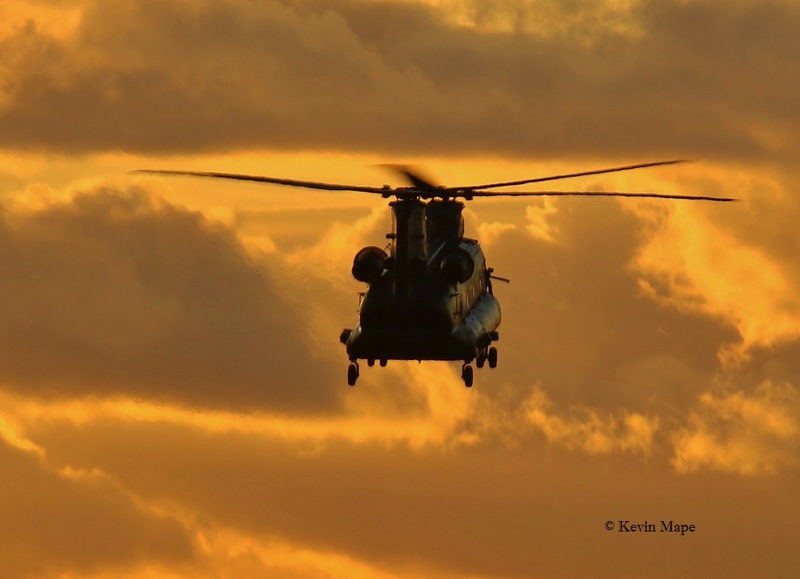 ZA705/AN/18Sqn/Chinook HC4 c/s “Pegasus 2” – To Donna Nook. & return. ZH106/06/8Sqn special/Sentry AEW1 c/s “NATO 30” – Parked on the ASP. 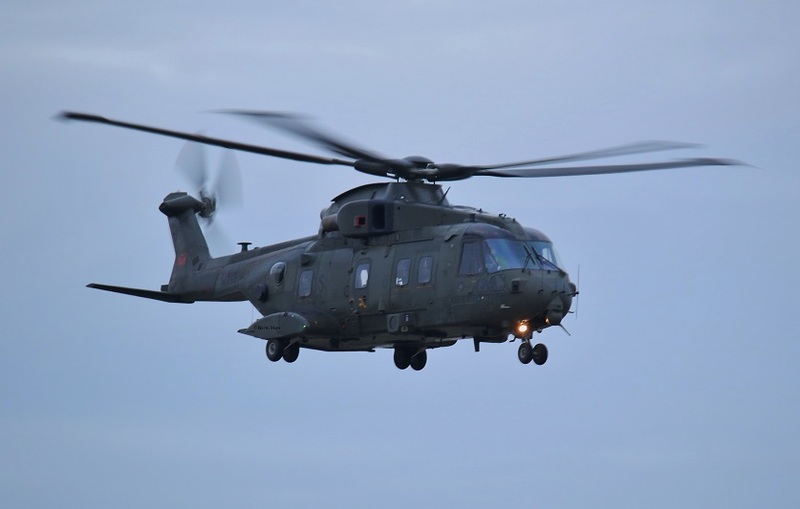 ZJ957/33Sqn/Puma HC2 c/s “Rider 1” – To Donna Nook. Noted on Sierra this morning all night stops. G-FFMV/Cobham/Da 42 Twin Star c/s “Rushton 73” – Parked on Sierra. 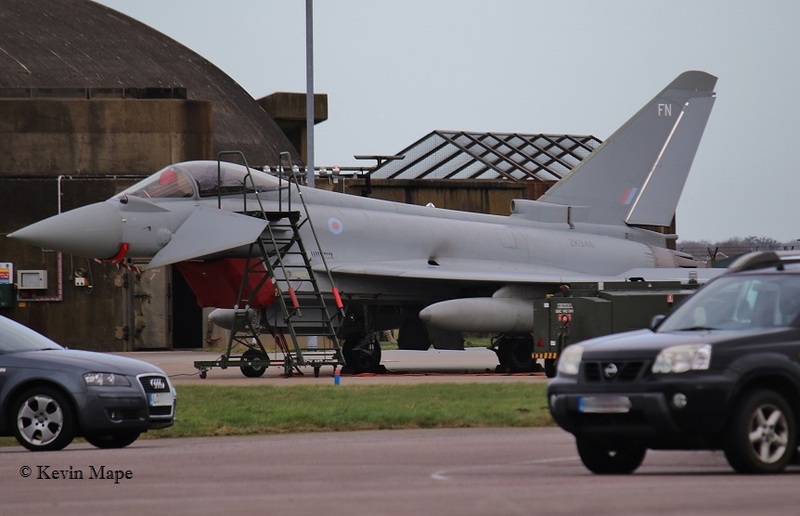 ZK352/Unmarked/Typhoon FGR4 c/s “Lossie 31” – Parked on the ASP. 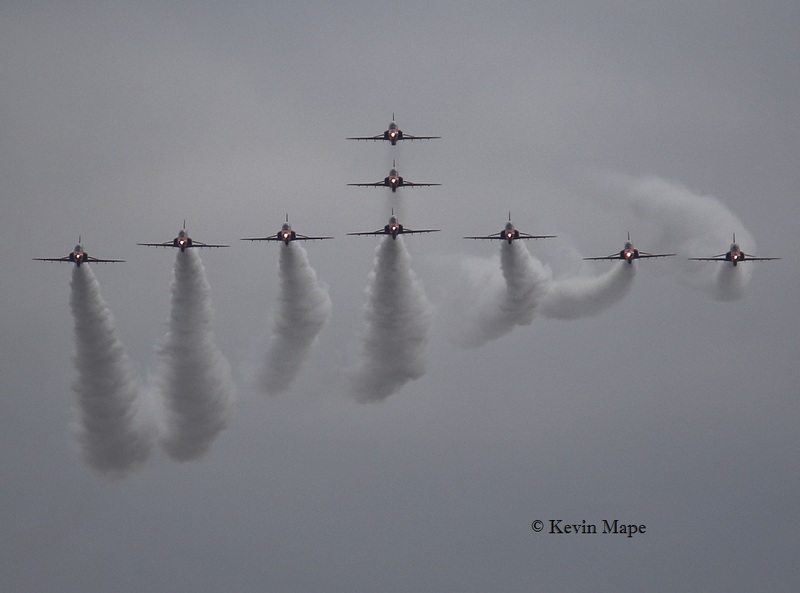 Echo – 11(F)Sqn – ZJ932/DB,ZJ805/BD,ZJ923/um. 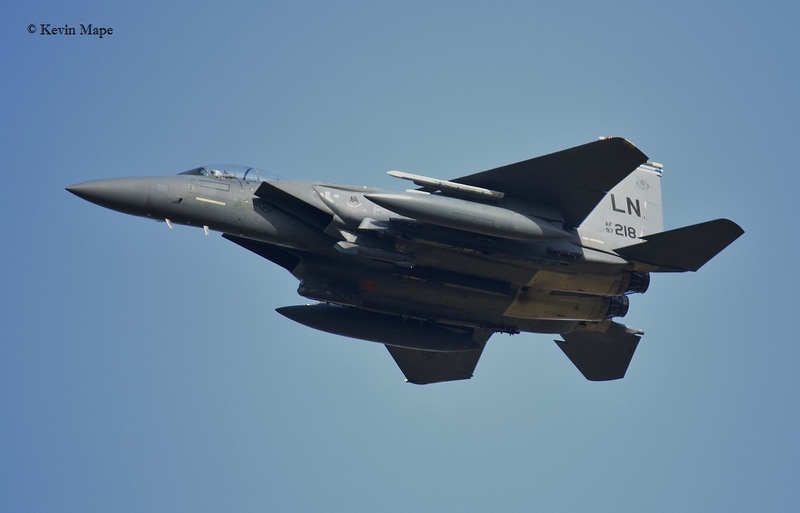 ASP – 8Sqn – ZH106,ZH107. 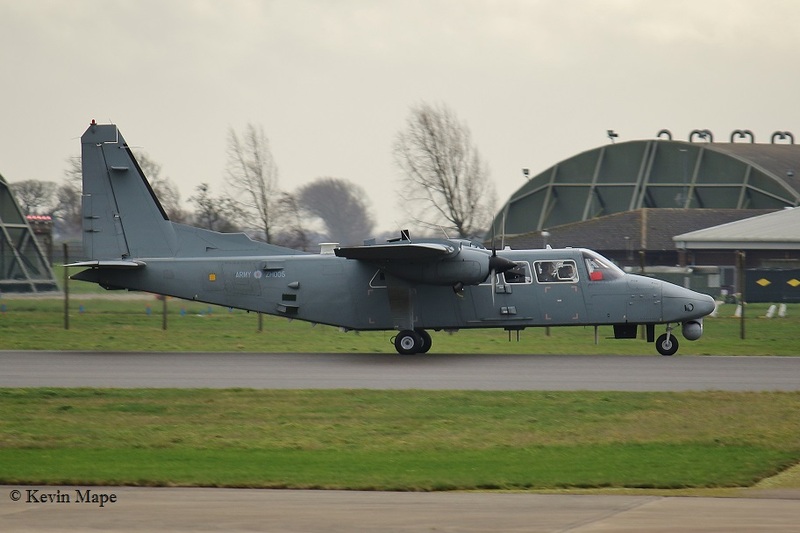 ZH101/01/8Sqn/Sentry AEW1 c/s “Nato 35” – Returned. 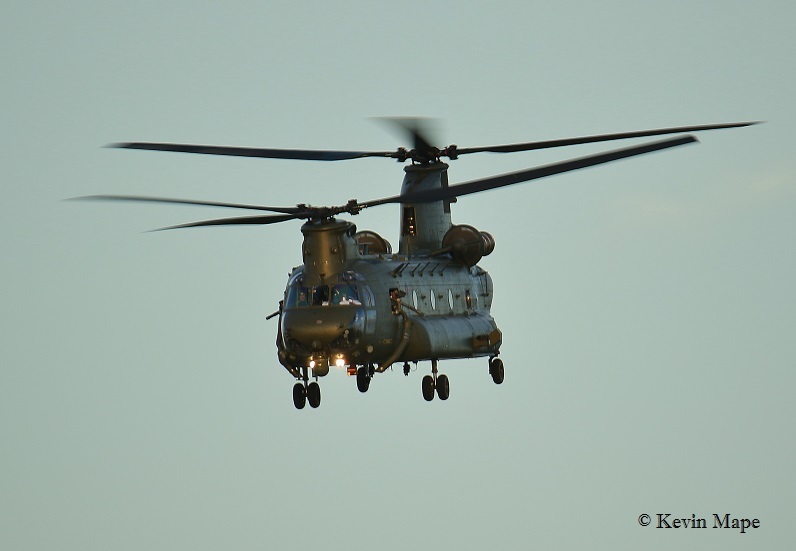 ZA705/AN/18Sqn/Chinook HC4 c/s “Pegasus 1” – To Holbeach. 3rd Wed Log tanks to Susie Matson & Brian H.
WK518/C/BBMF/Chipmunk T10 c/s “Chippy 9*- Departed. G-MAJD/JD/Eastern/Jetstream 41 c/s “East flt 105” in “106” – out. 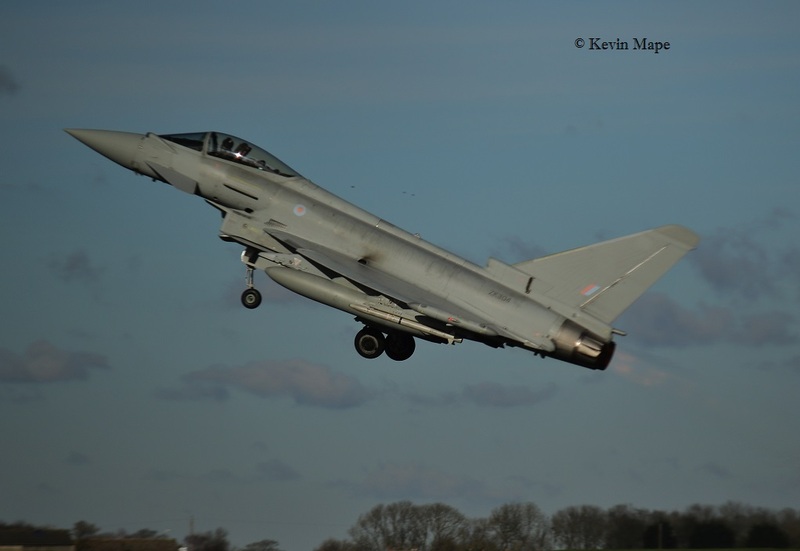 ZK341/FJ/1(F)Sqn/Typhoon FGR4 – still in full marks. 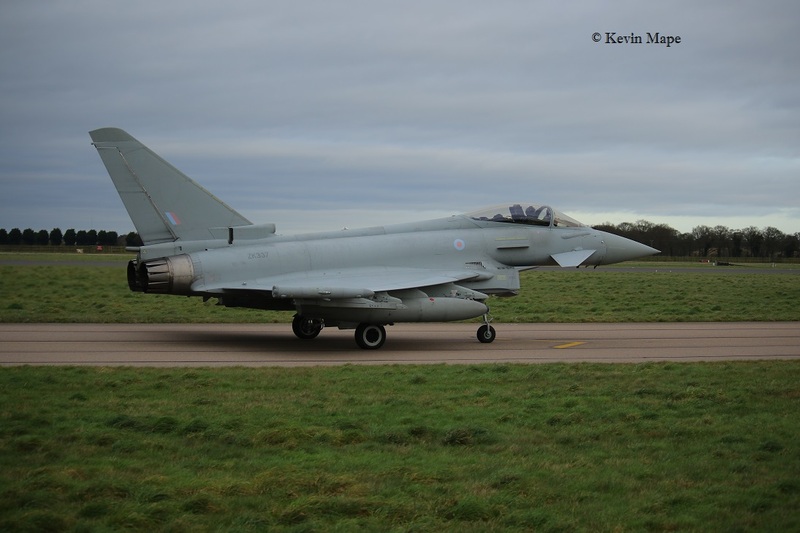 ZK317/ES/Unmarked/Typhoon FGR4 c/s “Lossie 31” – Delivery to Lossiemouth ex TMF. ZK451/K/45(R)Sqn/King Air B200 c/s “Cranwell **” – Overshoot. 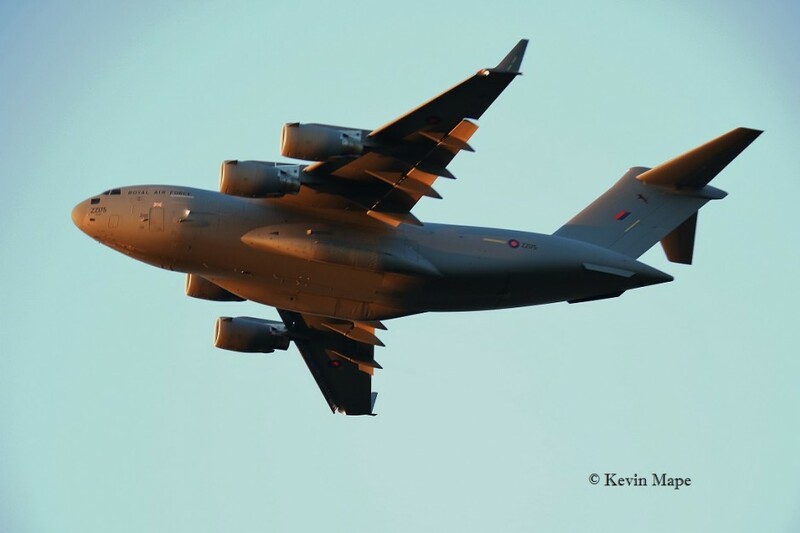 ZM405/405/A400M Atlas c/s “Ascot 4021” – landed only on the ground for 10 mins. – First visit. 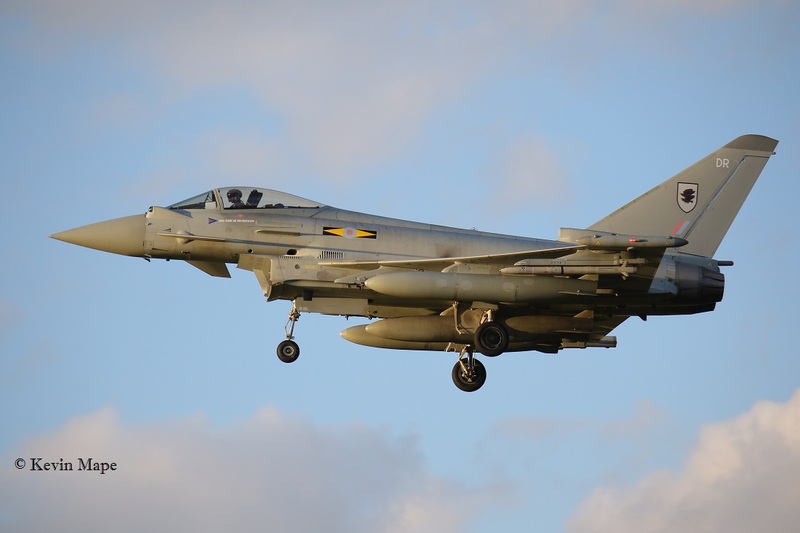 ZK934/QO-T/3(F)Sqn/Typhoon FGR4 c/s “*********” – Return from Lossiemouth. 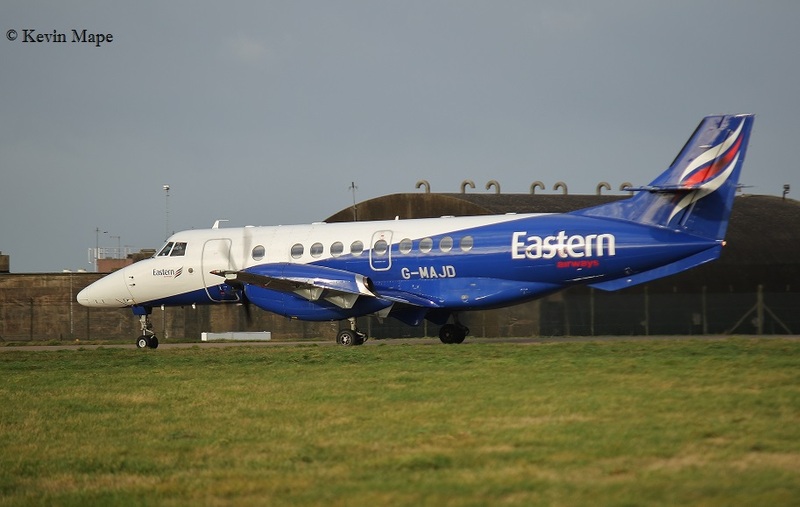 G-MAJD/JD/Eastern/Jetstream 41 /s “East flt 102” in “103” out. 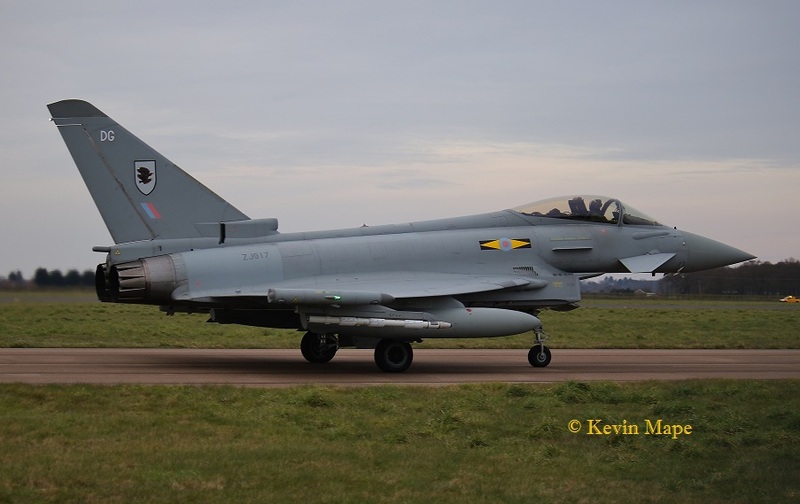 ZK383/FY/1(F)Sqn/Typhoon T3 c/s “Lossie **” – To TMF. 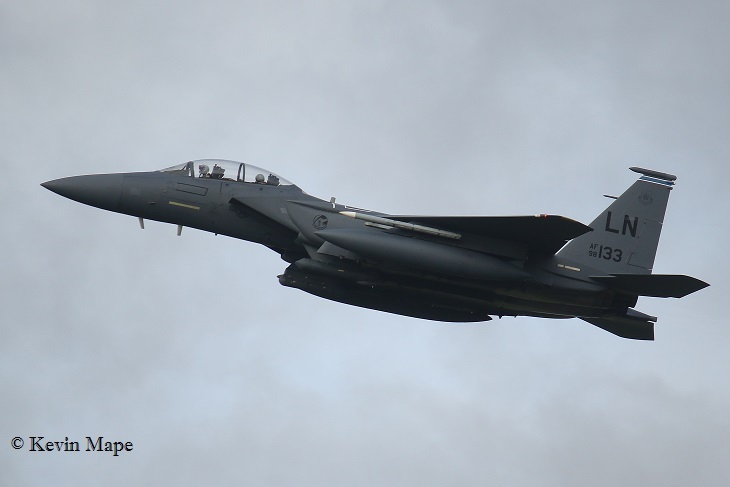 G-MAJD/JD/Eastern/Jetstrean 41 c/s East flt 104″ in “105” -out. High winds & rain showers. Gust up to 40 knots. 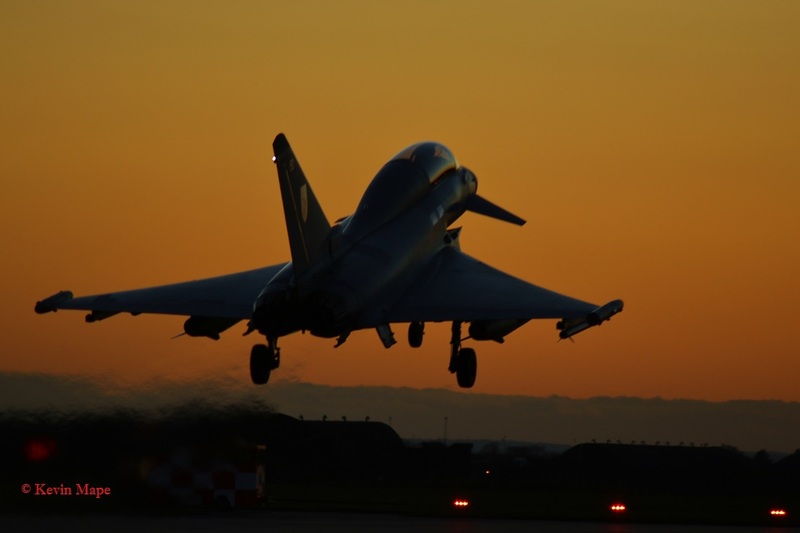 – 29(R)Sqn are night flying this week. plus 4 in the ASP Hangars. ZJ806/BE,ZJ814/BH,ZK325/FK,ZJ810/BI. ZH005/651Sqn/Defender AL2 c/s “Army air 520” – Parked on Sierra – Fuel stop & departed on a mission. 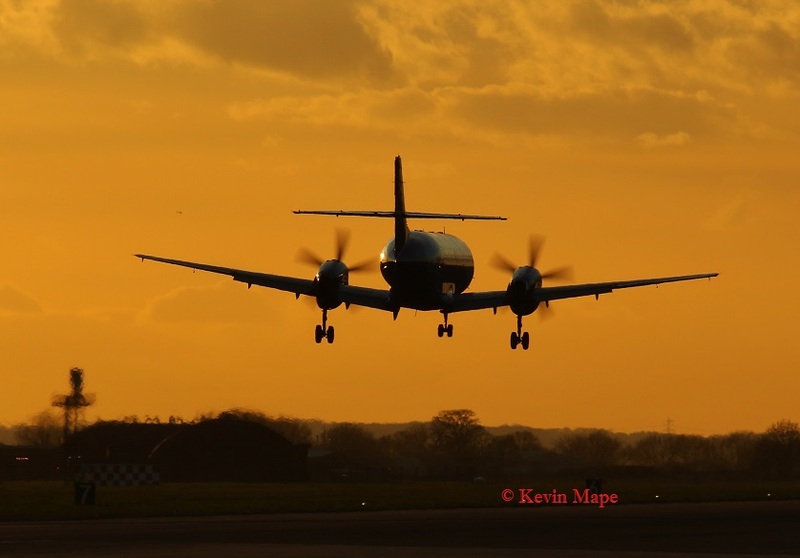 G-MAJD/JD/Eastern/Jetstream 41 c/s “East Flt 102” – in “103” – out. 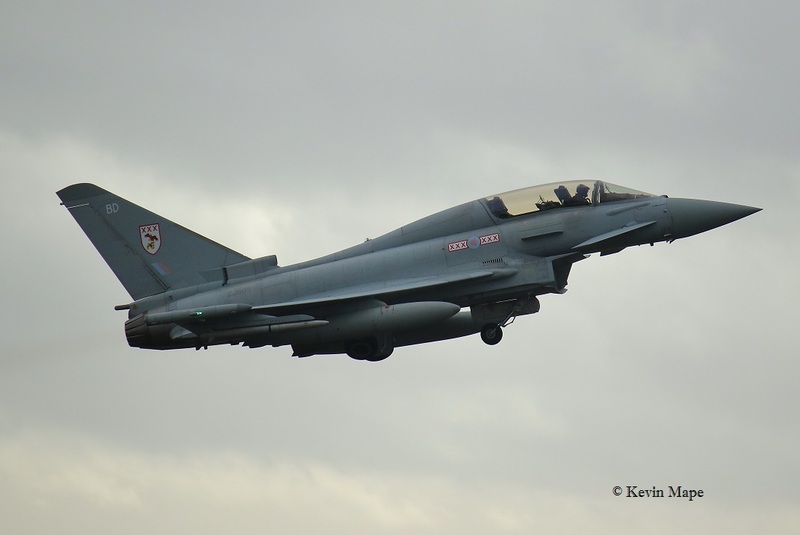 ZK353/BQ/29(R)Sqn 100 years special/Typhoon FGR4 – Noted on tow from South to North side. ZH101/01/8Sqn/Sentry AEW1 c/s “NATO 30” – Departed. ZH005/651Sqn/Defender AL2 c/s “Army air 520” – Departed on a mission. G-FRAW/AW/Cobham/Falcon 20 EW c/s “Zodic 1” – Parked on Sierra. G-MAJD/JD/Eastern/Jetstream 41 c/s “East Flt 104” – in “105” – out. 9th Tue Log Thanks to Steve & Val. Camera log thanks to Terry Senior. ZH005/651Sqn/Defender AL2 c/s “Army Air 520” – Ground abort. 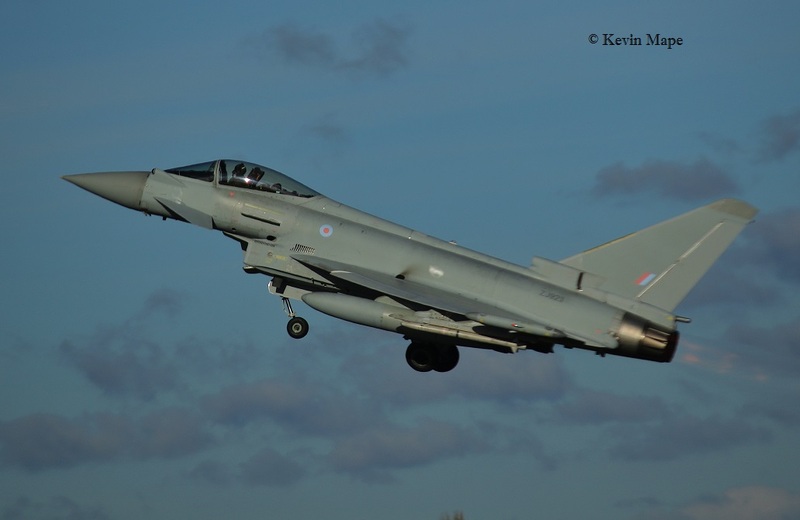 ZK301/D/1435 Flt/Typhoon FGR4 c/s” – Ground abort. ZK452/L/45(R)Sqn/King Air B200 c/s “Cranwell 82” – Overshoot. ZK452/L/45(R)Sqn/King Air B200 c/s “Cranwell 78” – Overshoot. ZK456/P/45(R)Sqn/King Air B200 c/s “Cranwell 75” – Overshoot. 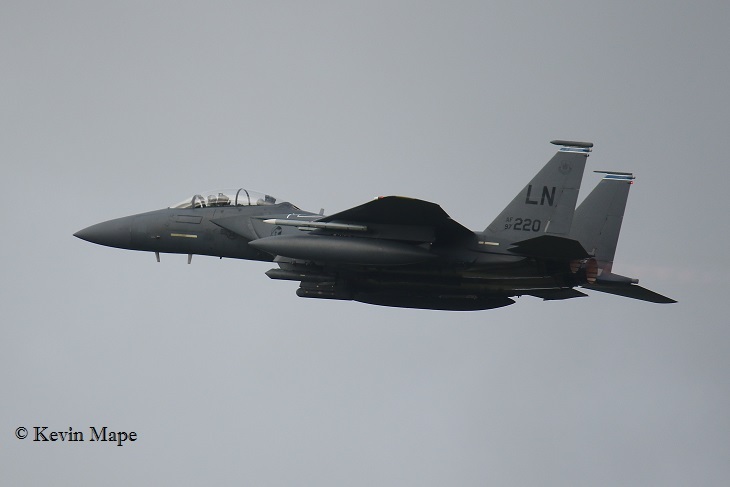 01-2000/LN bl/48FW/F-15E c/s “M****** 01” – Overshoot. ZK456/P/45(R)Sqn/King Air B200 c/s “Cranwell 68” – Overshoot. ZH106/06/8Sqn special/Sentry AEW1 c/s “NATO 35” – Departed. ZH002/651Sqn/Defender AL2 c/s “Army Air 520” – Parked on Sierra. ZA947/UK/Dakota III – 233Sqn marks. PA474/KC-A/Lancaster I – 617Sqn marks. P7350/EB-G/Spitfire IIa – 41Sqn marks. AB910/SH-F/Spitfire Vb – 64Sqn marks. TE311/4D-V/Spitfire LF.XVIe – 74Sqn marks. PZ865/EG-S/Hurricane IIc – 34Sqn marks. WK518/C/Chipmunk T10 – Hull UAS marks. WG486/Chipmunk T10 – BBMF marks. 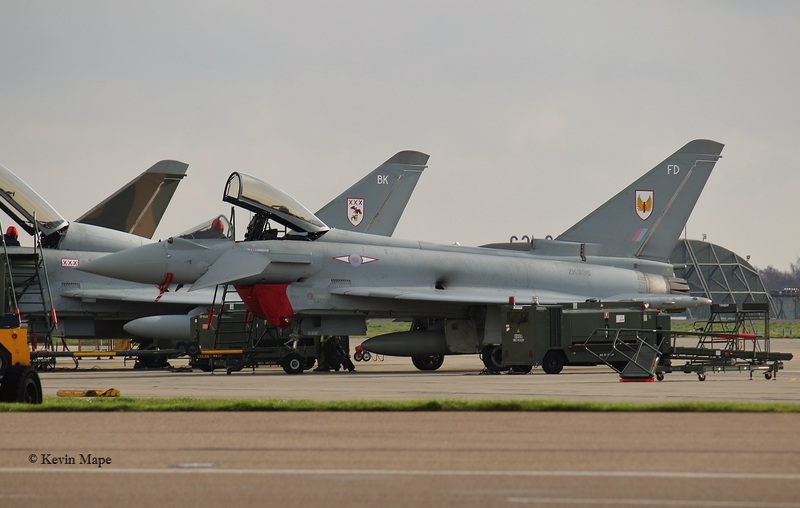 If you visit Coningsby go on the tour, It is well worth it ! 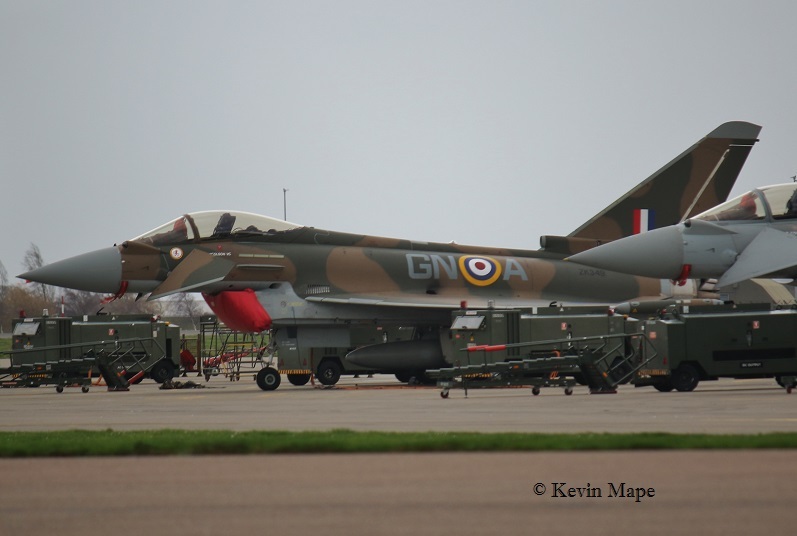 ZK315/41(R)TES special/Typhoon FGR4 c/s “Ascot 9411” – All three parked on 25 lazy- then returned to the ASP – No Tanker – All three departed later to USA on deployment. 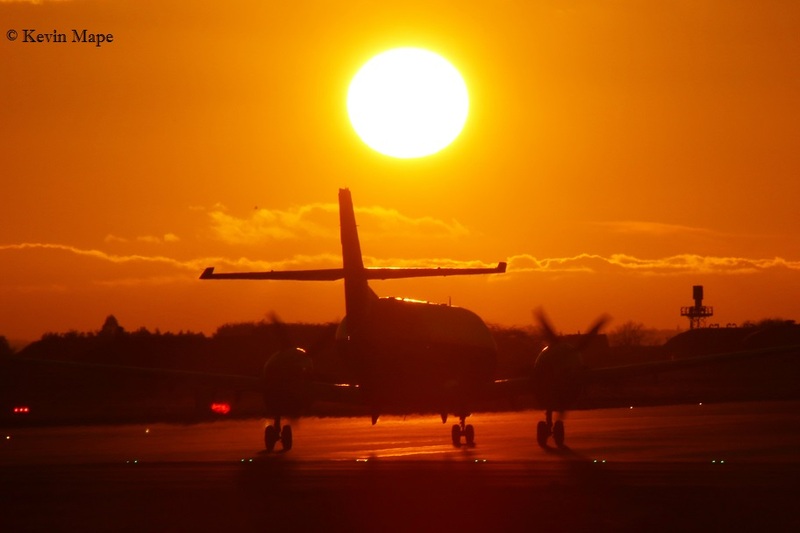 G-MAJD/JD/Eastern, Jetstream 41 c/s “East flight 104”- in “105” – out. 12th Fri – Log thanks to Susie Matson & Zac Hinchcliffe. 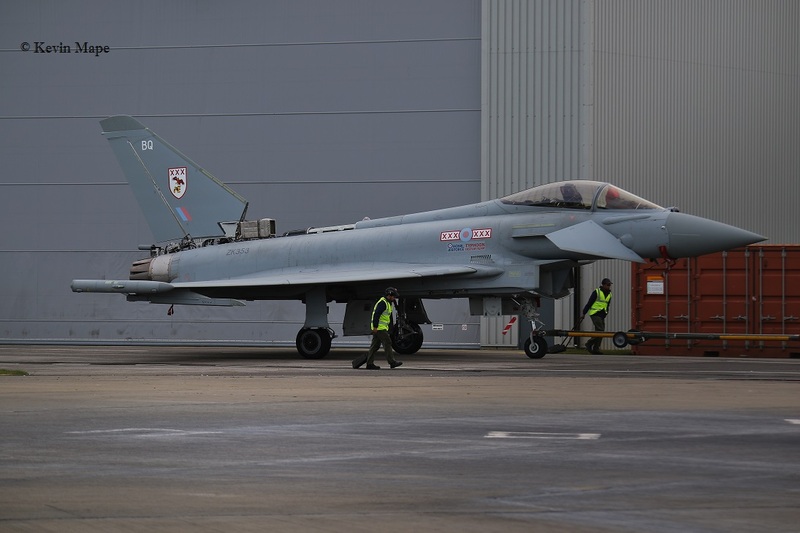 ZK340/Unmarked/Typhoon FGR4 c/s “Typhoon 18” – Delivery to Lossiemouth ex TMF. 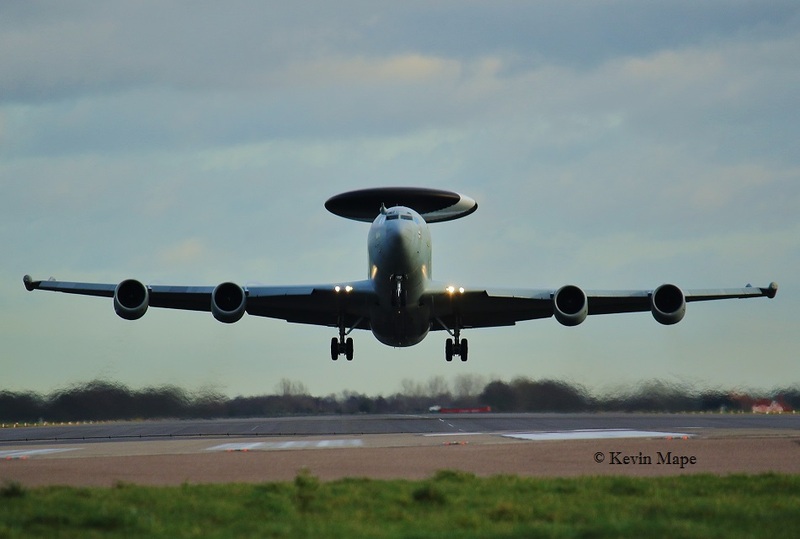 ZH101/01/ 8sqn/Sentry AEW1 c/s “NATO 31” – Landed. 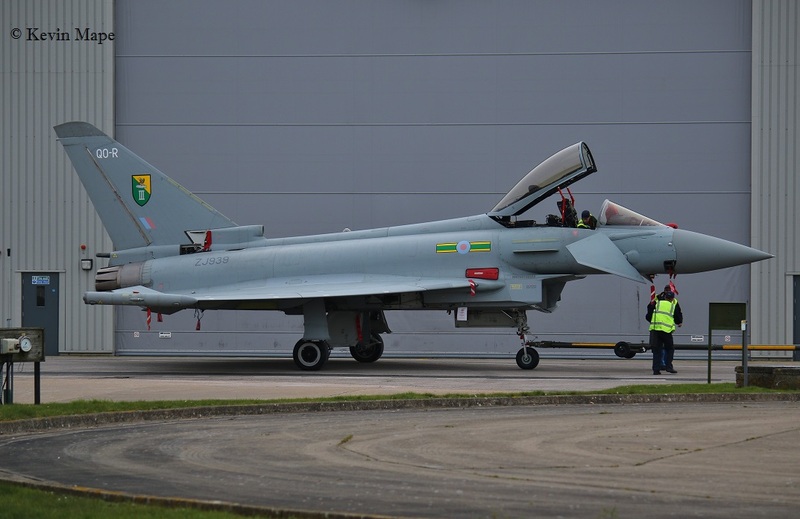 ZK353/BQ/29(R)Sqn special/Typhoon FGR4 – Towed over from the south side into in the Spray shop. 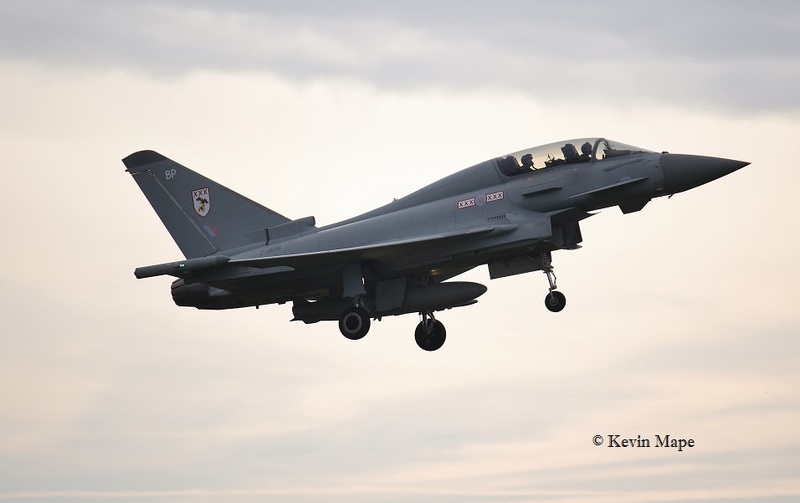 ZK349/GN-A/29(R)Sqn special/Typhoon FGR4 c/s “Typhoon 35” – Display practice at Holbeach. 51+09/LTG61/C-160 Transall c/s “German Air Force 291” – Parked on Sierra. 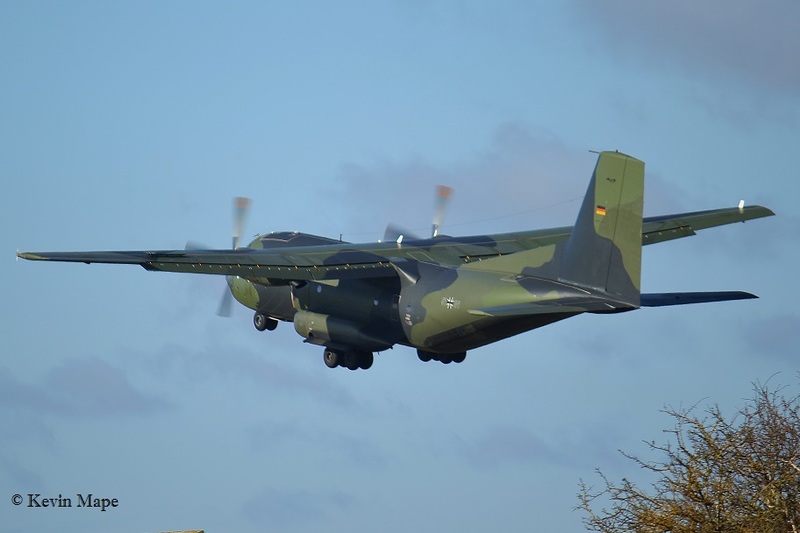 51+09/LTG61/C-160 Transall c/s “German Air Force 291” – Departed. 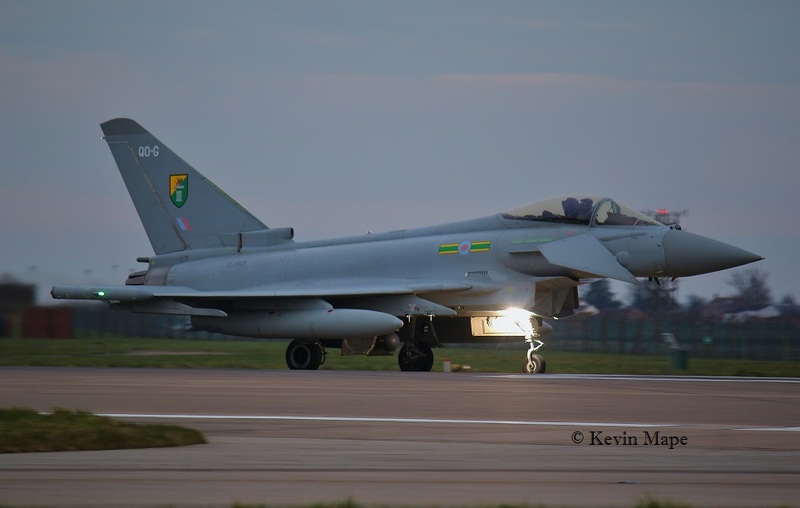 ZH106/06/8Sqn special/entry AEW1 c/s “NATO 31” – Departed – returned after dark. 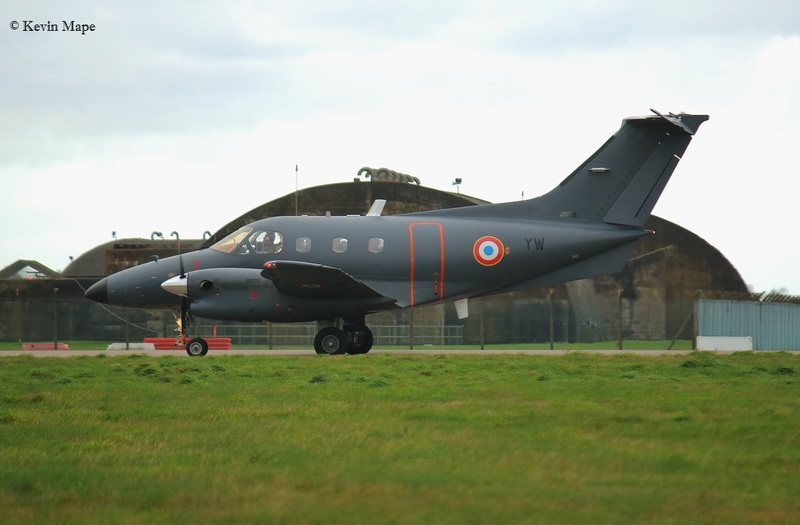 ZK454/O/45(R)Sqn/King Air B200 c/s “Cranwell 45” – Landed – Departed then Overshoots. 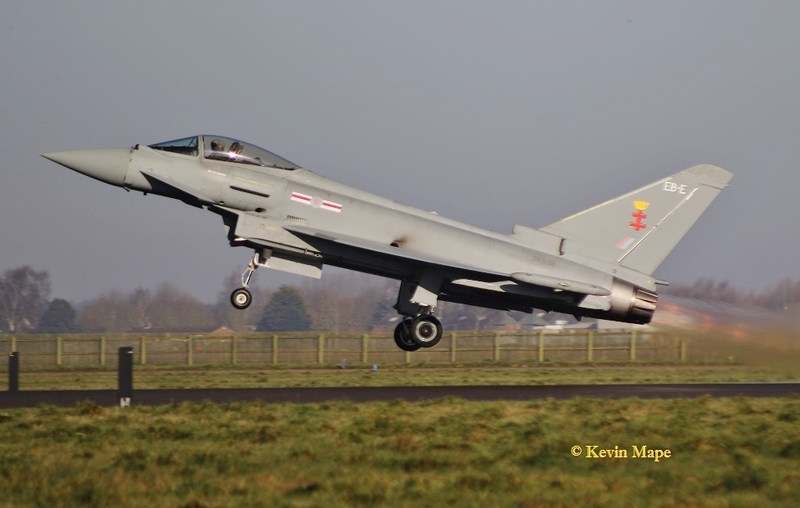 ZK339/EB-E/41(R)TES/Typhoon FGR4 c/s “Rebel 41” – PD Warton. 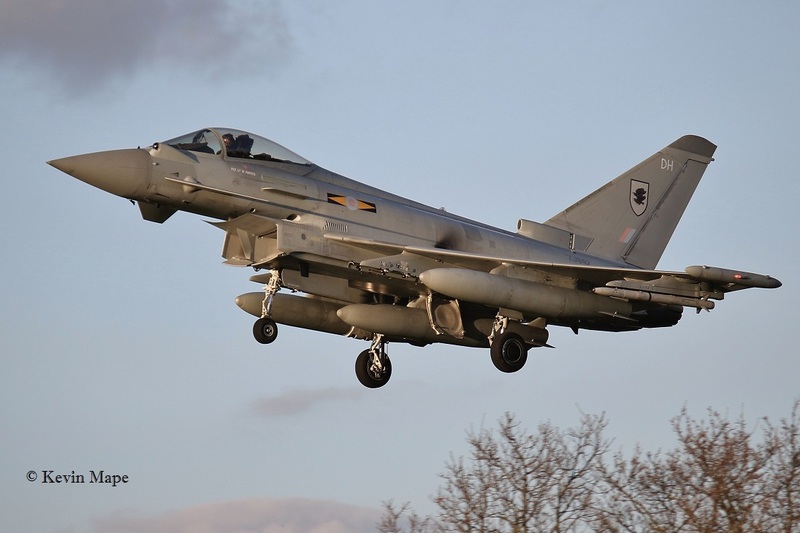 ZK304/Unmarked/Typhoon FGR4 c/s “Typhoon 81” – Delivery to Lossiemouth. 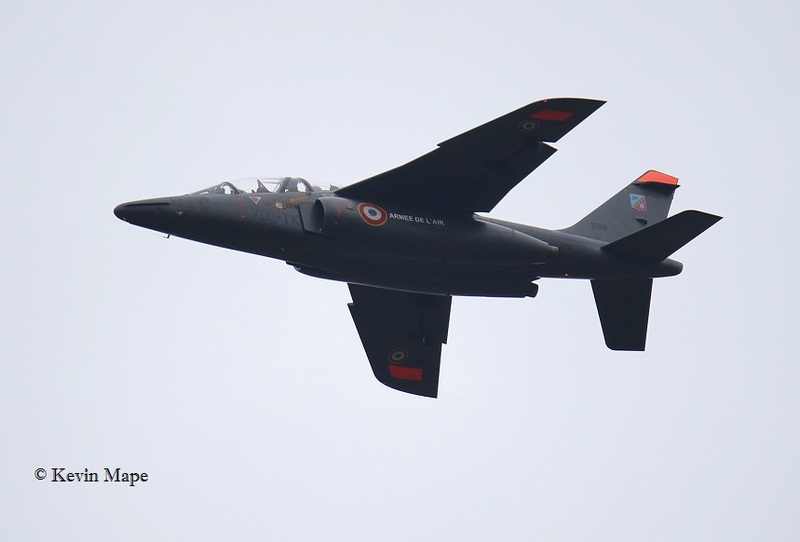 E137/705-LJ/EAC00.314/Alpha Jet E c/s “French Air Force 6441” – Overshoot. 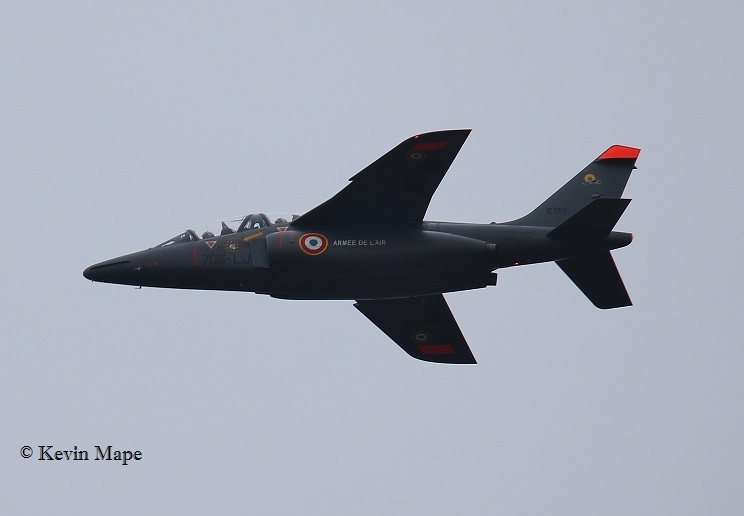 E56/705-TK/EAC00.314/Alpha Jet E c/s “French Air Force 6442” – Overshoot. 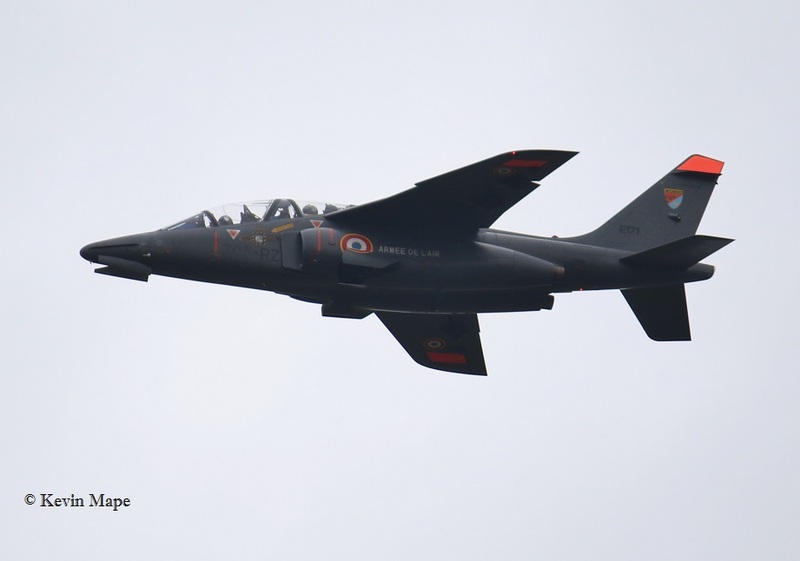 E171/705-RZ/EAC00.314/Alpha Jet E c/s “French Air Force 6443” – Overshoot. 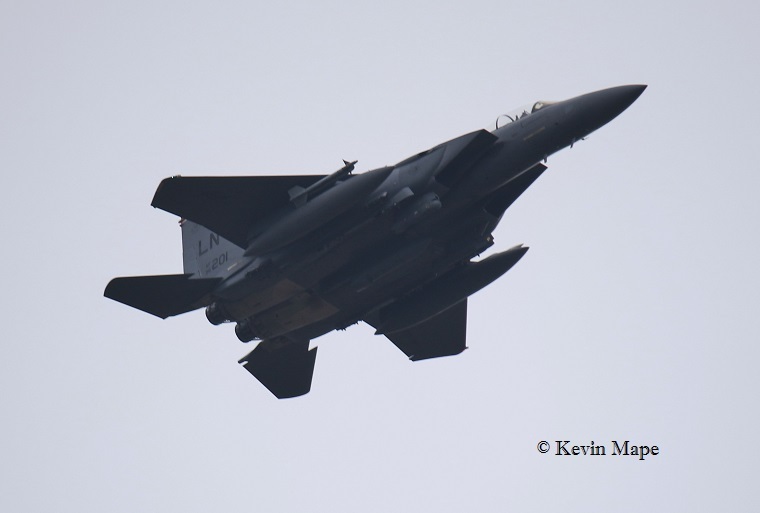 ZA462/027/Unmarked/Tornado GR4 c/s “Marham 63”- Overshoot. G-FFMV/Cobham/Da42 Twin Star c/s “Gonzo” – Parked on Sierra. RF-94101 & RF-94104 close to UK airspace. 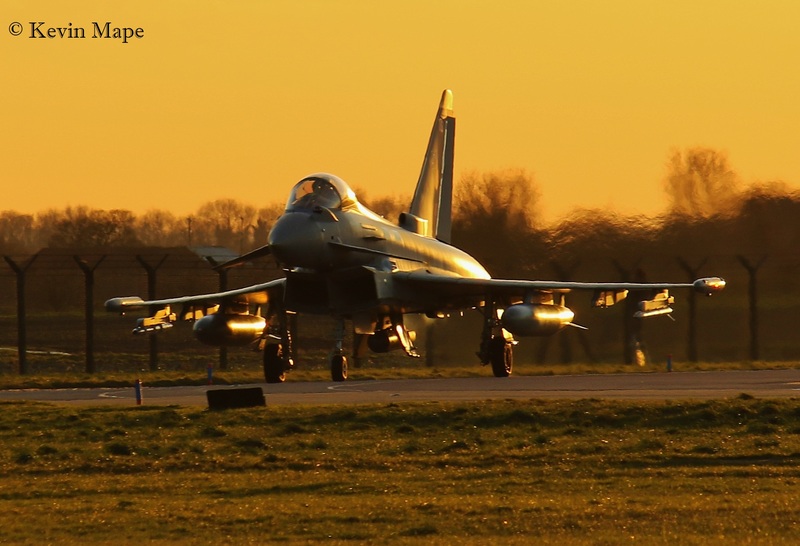 Picture via RAF Coningsby. G-FFMV/Cobham/Da42 Twin Star c/s “Gonzo” – departed. 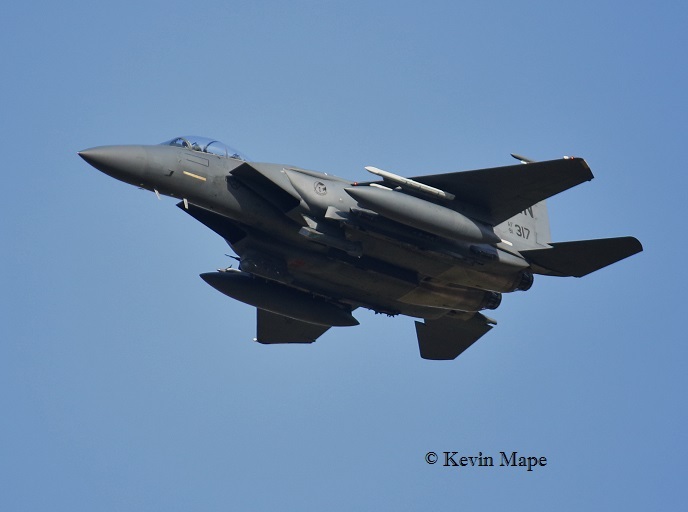 ZA462/027/Unmarked/Tornado GR4 c/s “Fang 31”- Overshoot. 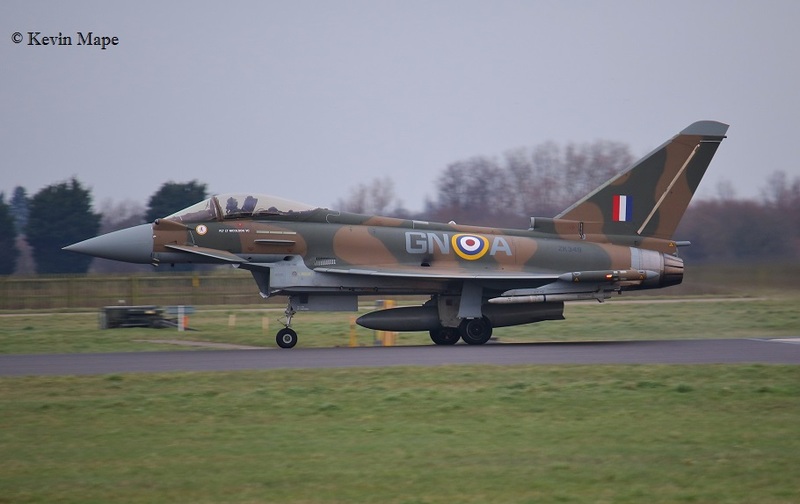 ZK301/D/1435 Flt/Typhoon FGR4 c/s “2 Zulu Oscar 42” – Returned. 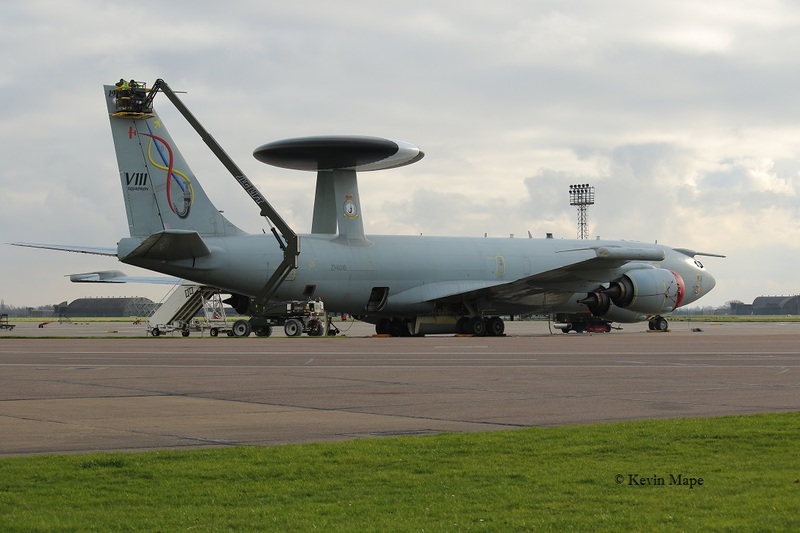 ZH106/06/8Sqn special/Sentry AEW1 c/s “NATO 35” – Returned. 18th Thur Log thanks to Rich & Susie Matson. 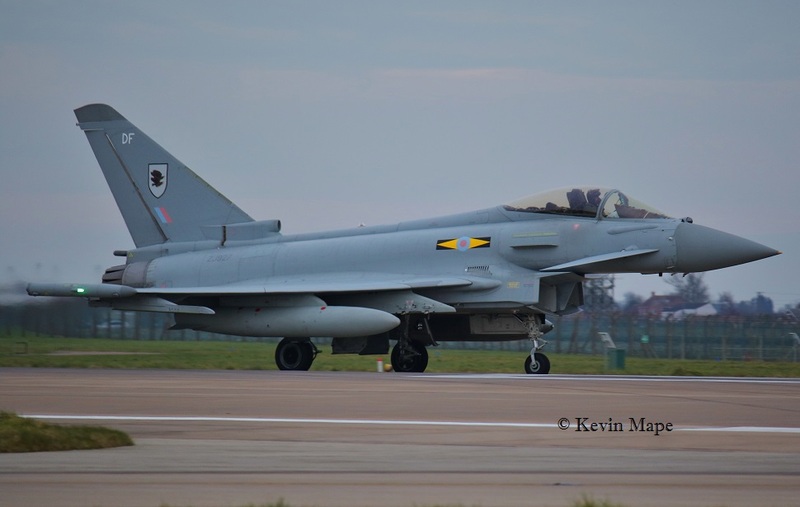 ZK369/Unmarked/Typhoon FGR4 c/s “Tarnish 5” – Delivery – 1st Tranche 3. 19th Fri Log thanks to Zac Hinchcliffe. ZH103/03/8Sqn/Sentry AEW1 c/s “NATO 30” – From Brize Norton. 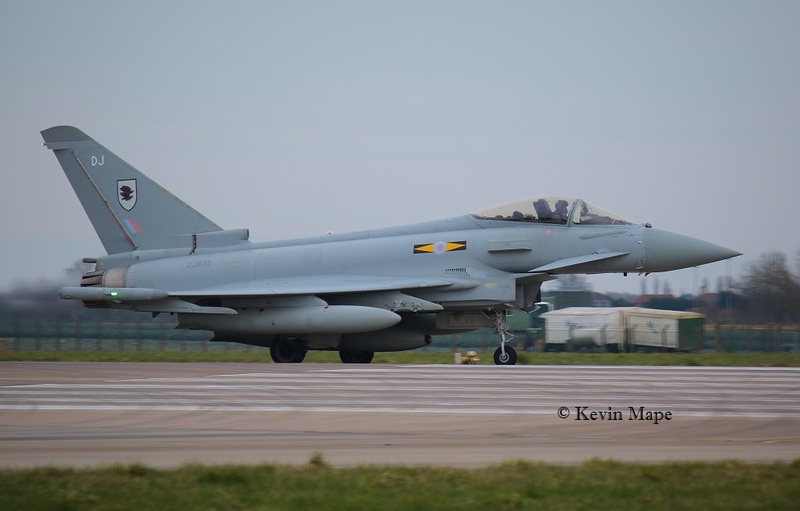 “Typhoon 81” – From Lossiemouth..
(TMF) -ZK341/Unmarked/ Typhoon FGR4 – Engine runs. G-MAJD/JD/Eastern/Jetstream 41 c/s “East flt 102” in “103” – out.- Parked on the ASP. 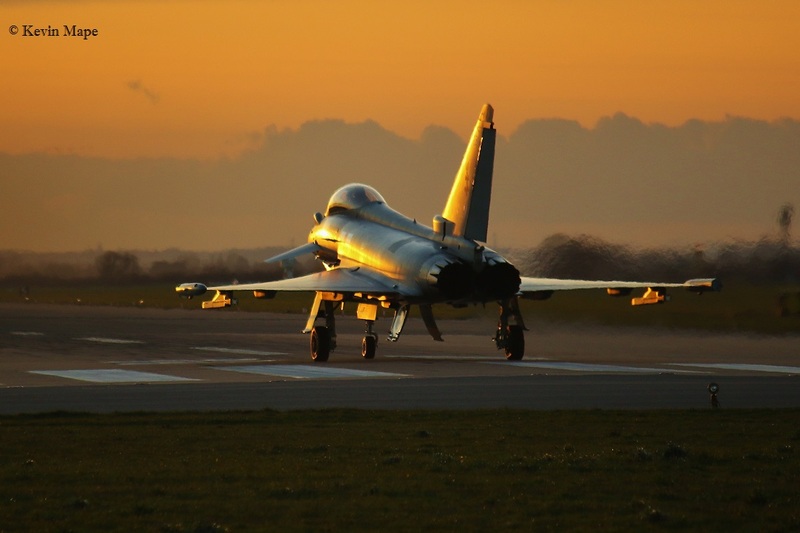 ZJ937/DT/11(F)Sqn/Typhoon FGR4 c/s “Typhoon 81” – PD at Lossiemouth. ASP – 8Sqn – ZH101,ZH103,ZH106,ZH107. TMF – ZK341/Unmarked – Engine runs ex FJ. 23rd Tue Log thanks to Steve & Val. G-MAJH/JH/Eastern/Jetstream 41 c/s “East flt 102” in “103” – out.- Parked on the ASP. 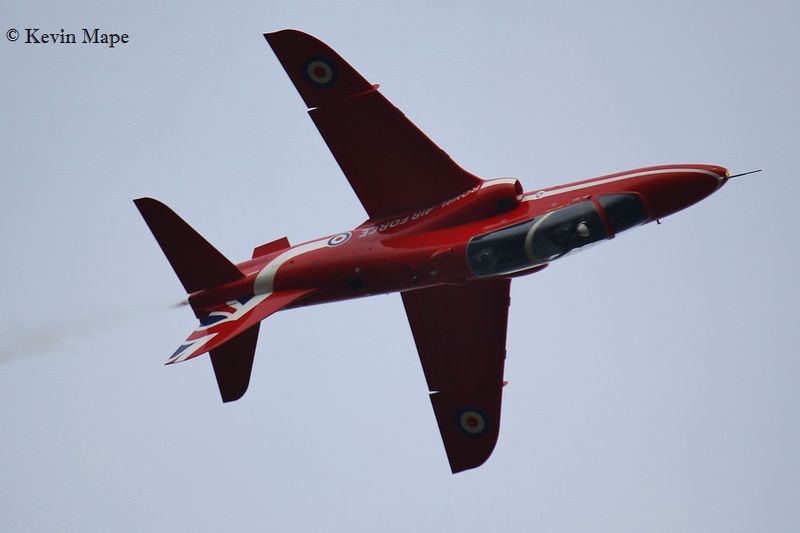 XX204/RAFAT/Hawk T1 c/s “Red 8” – Overshoot. ZJ205/4 Reg/Apache AH1 c/s “Army air 443” – Overfly both AM & PM. G-MAJH/JH/Eastern/Jetstream 41 c/s “East flt 104” in “105” – out.- Parked on the ASP. 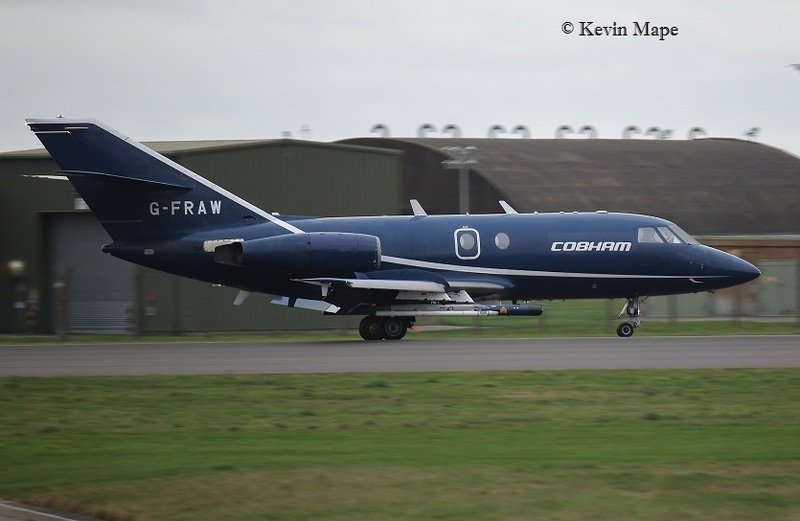 G-FRAW/AW/Cobham/Falcon 20 EW c/s “Zodiac 2” – Departed. 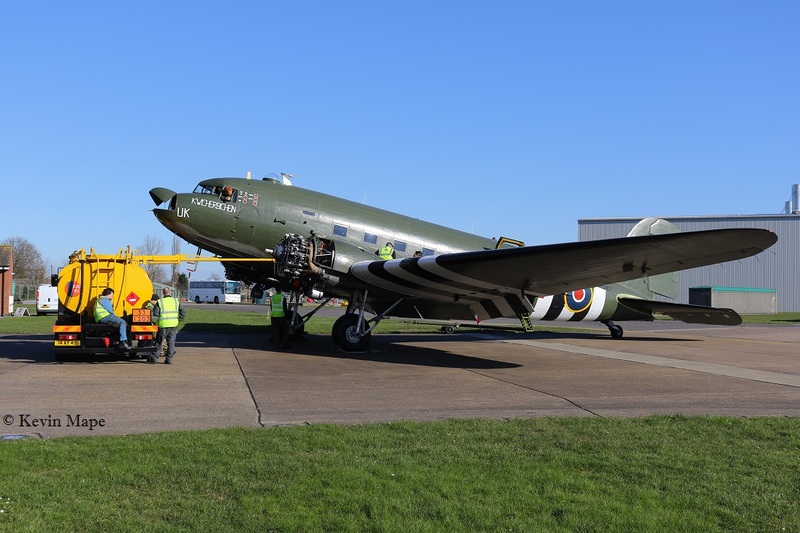 ZA947/UK/BBMF/Dakota III – Noted outside the BBMF. 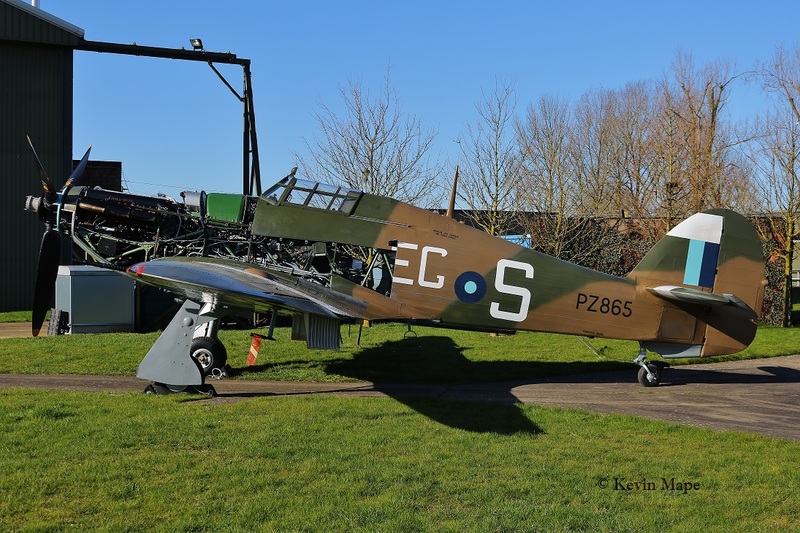 PZ865/EG-S/BBMF/Hurricane IIc – Noted outside the BBMF. G-FRAS/AS/Cobham/Falcon 20 EW c/s “Vader 23” – Parked on the ASP. WK518/C/BBMF/Chipmunk c/s ” Chippy 94″ – Crew training – mentioned Cranwell. 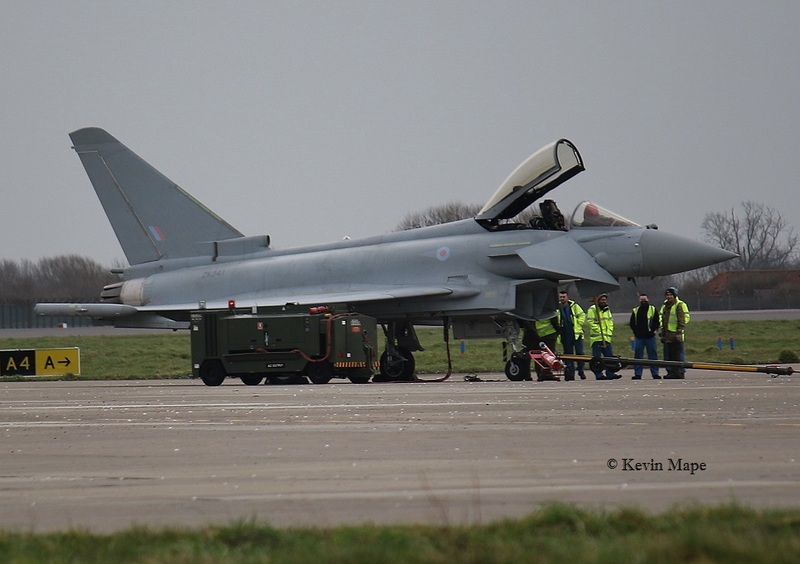 ZJ916/QO-S/3(F)Sqn/Typhoon FGR4 – Noted on tow today to the Southside. Paint shop – ZJ930/QO-R – Towed out of left hand booth to TMF. 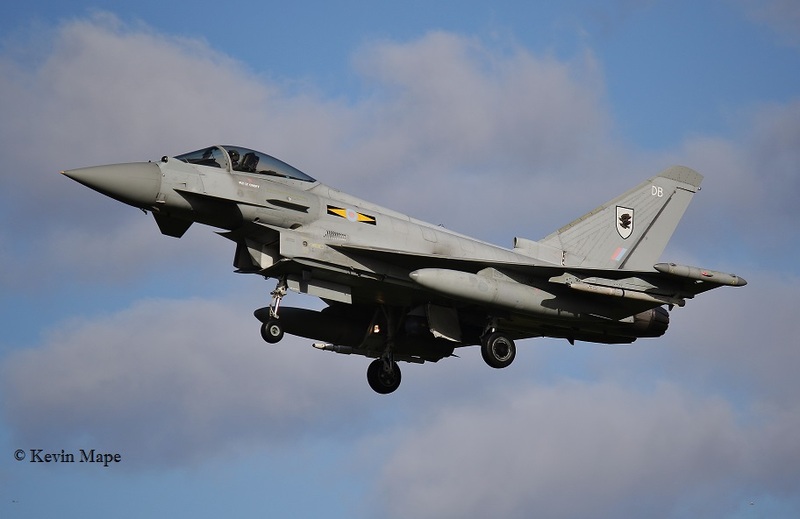 – Sqn badge is wrong. 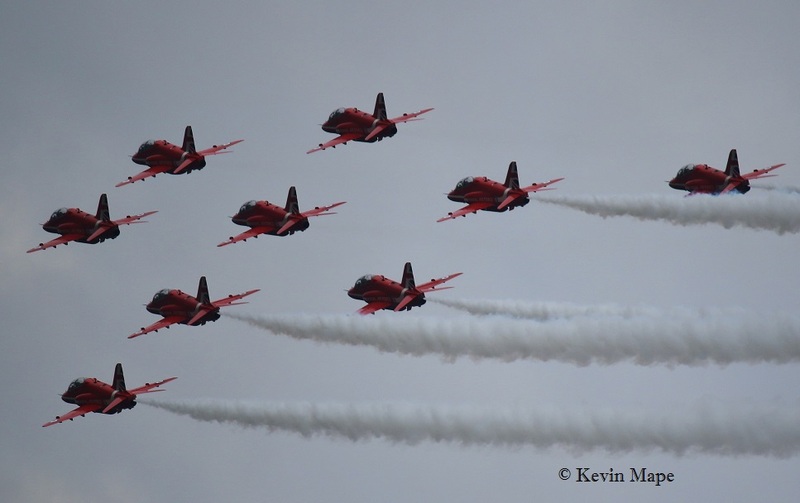 Red Arrow practice display with 9 x Hawk T1. 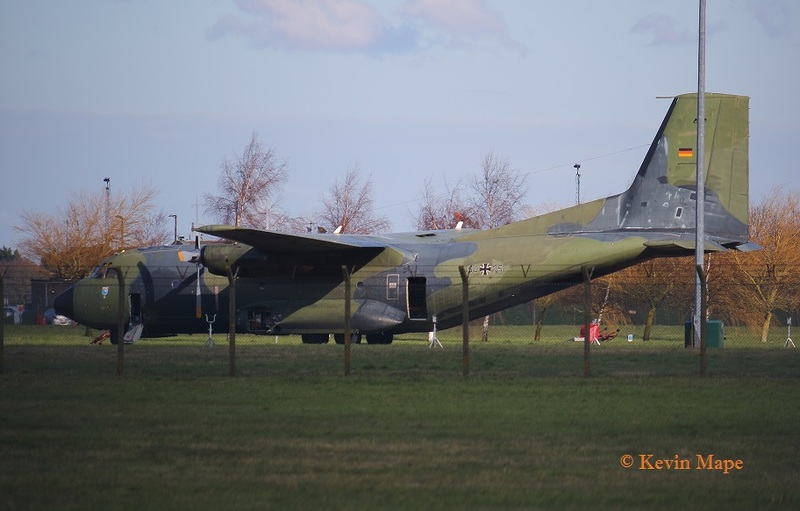 ZH103/03/8Sqn/Sentry AEW1 c/s “Rafair 7025” – Landed. ZH101/01/8Sqn/Sentry AEW1 c/s “NATO 38” – Departed. 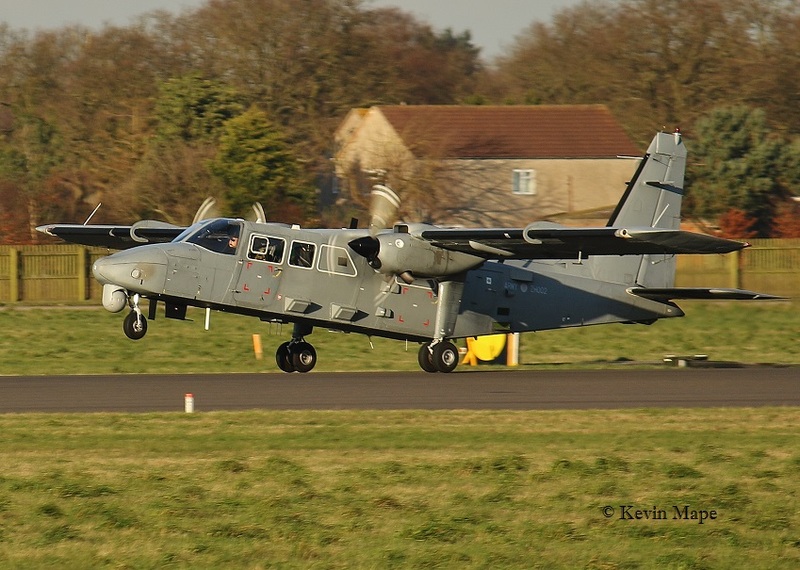 ZH101/01/8Sqn/Sentry AEW1 c/s “NATO 38” – Landed. 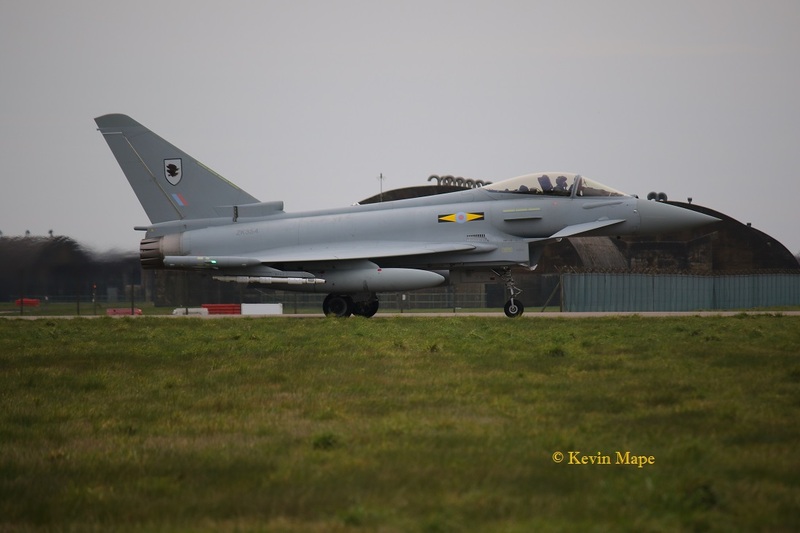 ZK354/u/c/11(F)Sqn/Typhoon FGR4 ex DG – f/n uncoded. ZJ134/S/ 28/78Sqn/Merlin HC3 “NAVY 432” – Parked near the ASP..
ZK338/FF/Unmarked/Typhoon FGR4 c/s ” Lossie 43 ” To Lossiemouth. 50+81/LTG61/C-160D Transall c/s “German Air Force 274” – Parked on Sierra – with spares for 50+75. 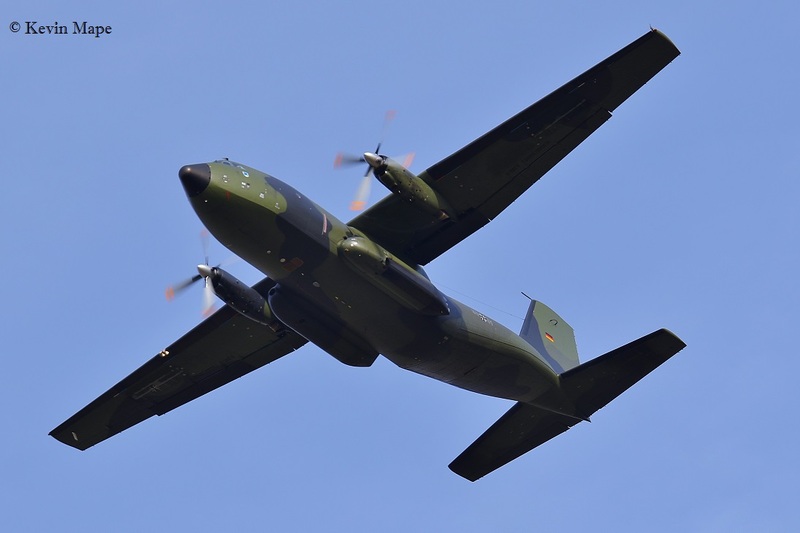 50+75/LTG61/C-160D Transall c/s “German Air Force 214” – Departed after repair. ZH106/06/8Sqn special/Sentry AEW1 c/s “Rafair 7026” – Departed. 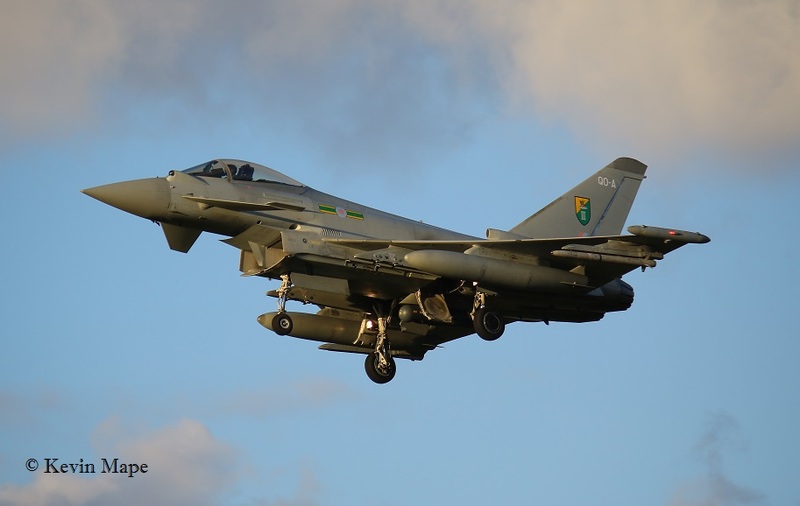 BBMF – P7350/EB-G – noted outside. A great month for visitors. (3rd) ZK341/FJ – Noted on the Wash pan. (19th) u/m on the ASP. (22nd) u/m Engine runs on the ASP. 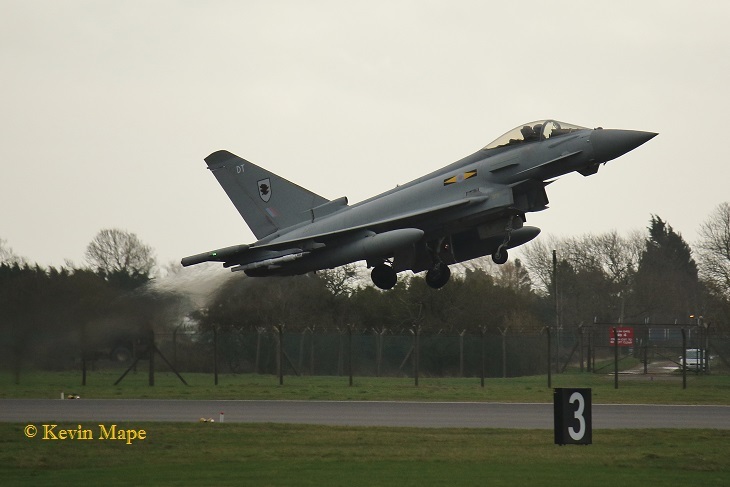 (5th) ZK383/FY – Arrived from Lossiemouth . (26th)ZJ939/QO-R – Towed out of the Paint shop. 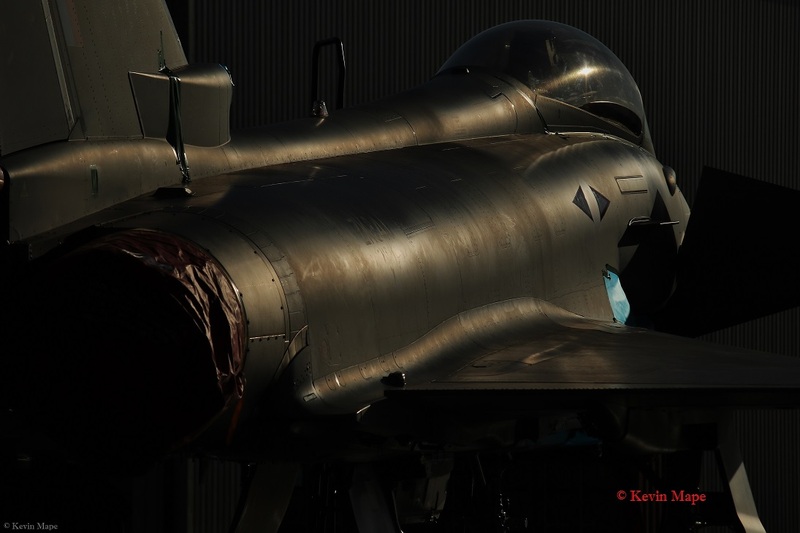 (29th)ZK333/FS – Noted on the ASP.